For the first time, a team of scholars and archaeologists has recorded and interpreted Cherokee inscriptions in Manitou Cave , Alabama. These inscriptions reveal evidence of secluded ceremonial activities at a time of crisis for the Cherokee, who were displaced from their ancestral lands and sent westward on the Trail of Tears in the 1830s. "These are the first Cherokee inscriptions ever found in a cave context, and the first from a cave to be translated," said Jan Simek, president emeritus of the University of Tennessee System and Distinguished Professor of Science in UT's Department of Anthropology. Simek is a co-author of the study "Talking Stones: Cherokee Syllabary in Manitou Cave, Alabama," published recently in Antiquity. "They tell us about what the people who wrote on the walls were doing in the cave and provide a direct link to how some Native Americans viewed caves as sacred places ." Cherokee inscriptions - this syllabary was translated as "leaders of the stickball team on the 30th day in their month April 1828." Source: A. Cressler / Fair Use . The research team that worked to understand the nature and meaning of these historic inscriptions included scholars from the Eastern Band of Cherokee Indians, the United Keetoowah Band of Cherokees , and the Cherokee Nation of Oklahoma as well as Euro-American archaeologists. 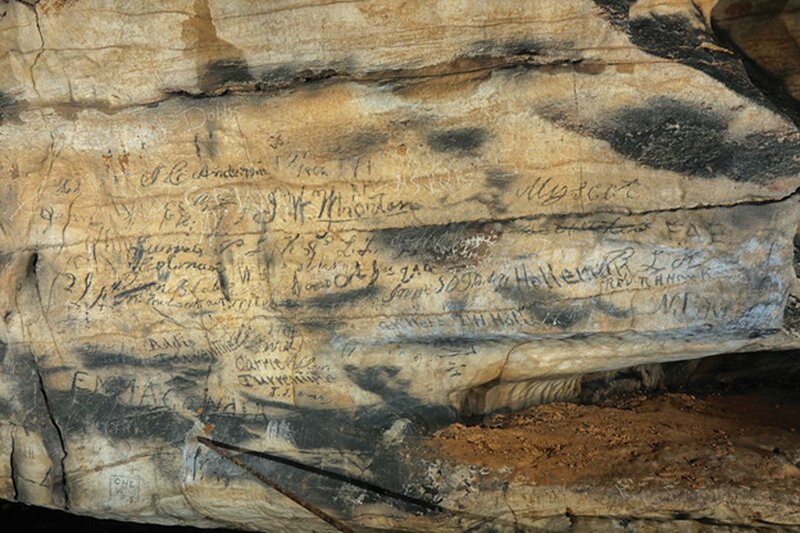 The researchers concentrated on two main groups of Cherokee inscriptions found in Manitou Cave, a popular tourist site near Fort Payne, Alabama. Until now, indigenous uses of the cave had been unrecorded, as typical archaeological evidence like artifacts or deposits have been removed during its time as a tourist attraction. The first inscription records an important ritual event that took place in 1828, translated as "The leaders of the stickball team on the 30th day in their month April 1828." A nearby inscription reads "We who are those that have blood come out of their nose and mouth." Stickball is a Cherokee sport similar to lacrosse. "It is far more than a simple game," Simek said. "It is a ceremonial event that often continues over days, focusing on competition between two communities who epitomize the spirit and power of the people and their ancestors." A second series of inscriptions is located on the ceiling nearer to the entrance of the cave. "The ceiling inscriptions are written backwards, as if addressing readers inside the rock itself," Simek said. "This corresponds with part of one inscription which reads 'I am your grandson.' This is how the Cherokee might formally address the Old Ones, which can include deceased Cherokee ancestors as well as comprise other supernatural beings who inhabited the world before the Cherokee came into existence." The inscriptions analyzed by researchers indicate that caves like Manitou were seen by the Cherokee as spiritually potent places where wall embellishment was appropriate in the context of ceremonial action. Since their work in Manitou Cave, the researchers have identified several caves with similar inscriptions. They will continue to collaborate as scholars from the three federally recognized Cherokee tribes and archaeologists. "Our research has shown that the Cherokee voice in Alabama did in fact outlast the Trail of Tears," Simek said. "We will continue to document and protect these previously unknown records of indigenous American history and culture." The article ‘ Cherokee inscriptions in Alabama cave interpreted ’ was originally published in Science Daily. Source: University of Tennessee at Knoxville. “ Cherokee inscriptions in Alabama cave interpreted .” Science Daily. Science Daily . 10 April 2019.